of the Junior School, would organise. That was in 1956. I still collect stamps 60 years on! We had Wednesday afternoons off to play games, which was never my forte. I recall that I was regularly bottom of my class of 24. Only when I reached 14 did things click for this late developer! a Grand Lodge Officer to the Old Hymerians Lodge I decided that perhaps he wasn’t as bad as I remembered. It was Doc Findlay who gave me a love of History, Mr Grayson of literature and books and Norman Walker made even Latin seem fascinating. I now have my own Coat of Arms and my motto is ‘Vive ut Vivas’ – live life! But best I look back to Graham Watson whose patience got me through music O-level and instilled in me an enduring appreciation of music. Practising for Handel’s Messiah in the Hall for the Christmas Concert and singing in the chorus of HMS Pinafore in the Memorial Hall are abiding memories. Now I enjoy Messiah at St Paul’s in December and Opera at Glyndebourne in the Summer. into Oxford. I decided to read Law even though I had no legal connections and had only once visited the Courts then housed in the Guildhall in Hull. The present Recorder of Leeds, Peter Collier, was in my class. He told me that he was going to read for the Bar. I thought if he could, then so could I. My father was a schoolmaster. His was a solicitor. My father could get me no briefs. His father could get him lots - and did! When I told my mother that I was going to read for the Bar she said ‘Why not become a Probation Officer dear? So much more useful’. Over my years on the Bench I have come to admire the qualities of the Probation Service – patience, tolerance and understanding. As my wife says – I would not have made a good Probation Officer. You are required to join an Inn of Court if you want to go to the Bar. In 1967 I joined Middle Temple. It cost £100 to do so. I’ve never regretted it. 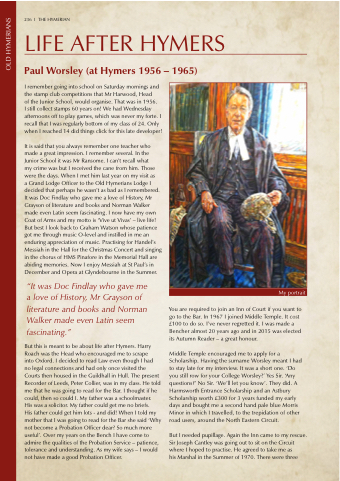 I was made a Bencher almost 20 years ago and in 2015 was elected its Autumn Reader – a great honour. Middle Temple encouraged me to apply for a Scholarship. Having the surname Worsley meant I had to stay late for my interview. It was a short one. ‘Do you still row for your College Worsley?’ Yes Sir. ‘Any questions?’ No Sir. ‘We’ll let you know’. They did. A Harmsworth Entrance Scholarship and an Astbury Scholarship worth £300 for 3 years funded my early days and bought me a second hand pale blue Morris Minor in which I travelled, to the trepidation of other road users, around the North Eastern Circuit.